As development facilitator, Dr Andrea Polzer-Debruyne assists in building organisational success by aligning the activities of organisations, the teams within them, and individual staff members. In assisting her clients Andrea draws on her extensive experience and uses evidence-based research in the fields of Psychology and Human Resources as well as her analytical skills, sense of humour, and plain common sense. 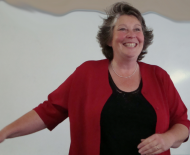 TetraMap has become an integral part of my facilitation tool kit, because I have seen its principles work – not only during the workshops but also in ‘real life’. Being able to use a metaphor-based tool that has intuitive appeal and avoids people feeling placed into ‘pigeon holes’ enriches not only my professional practice – it also helps my clients and their teams take constructive steps towards their goals. Andrea’s facilitation skills are exceptional. She engages and enthuses her audience. Her ability to recognise the individual needs of each participant and her sense of humour contribute to the success of her courses/presentations. She is not only an expert in her field but she is passionate about it as well. Working with Andrea is a delight!